Playwright Benn W. Levy pulled off an amazing feat in the first week of January 1932. After opening a hit comedy, Springtime for Henry in December 1931, he opened The Devil Passes starring Basil Rathbone four weeks later. Both were hits, but it is Springtime for Henry that has survived to be a minor classic. 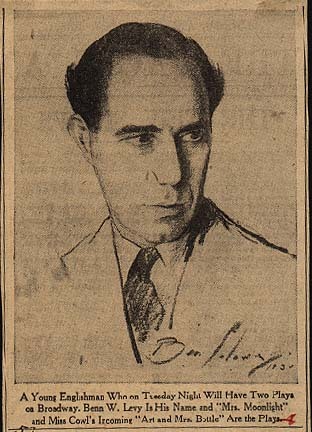 Levy (drawn by Ben Solowey in 1930) lived to see the play revived on Broadway on three different occasions. In this area, people might remember that it was the first play to offered at the famed Bucks County Playhouse in 1939. 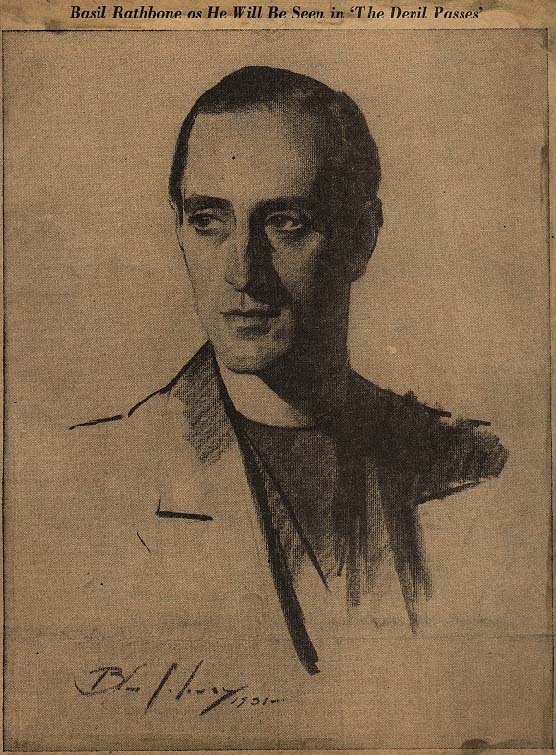 Soloweys portrait of Rathbone in The Devil Passes appeared on the first Sunday of 1932 in the Herald Tribune. 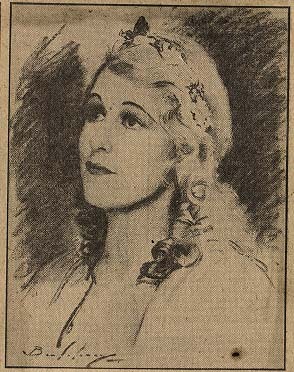 On the same day, The New York Times featured a Solowey portrait of Blanche Yurka as Electra. 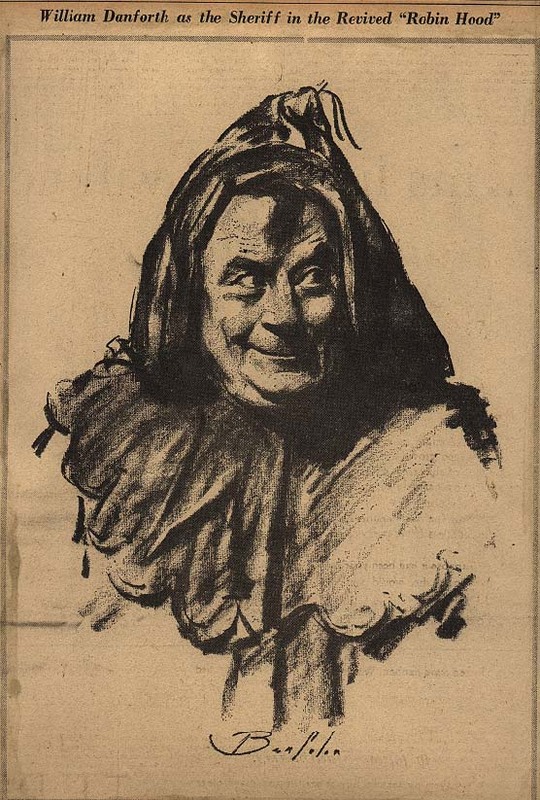 There would be 50 more portraits this year, a mixture of theater and opera drawings that captured a slice of the performing arts in New York at the time. The Opera portraits included a veritable Whos Who of the period including Leon Rothier, Lily Pons, Edmund Johnson, and Grace Moore. 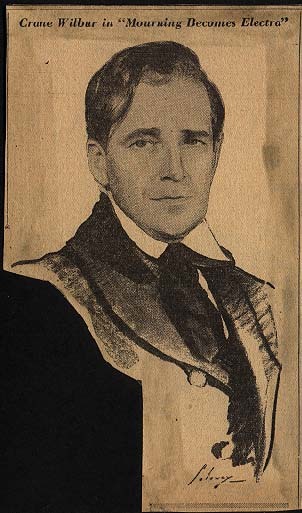 The Rothier portrait has had a colorful history. It was purchased as a gift to the singer after appearing in the New York Post on March 5, 1932. After a dinner honoring the singer the drawing came to hang for many years in the old Metropolitan Opera House. 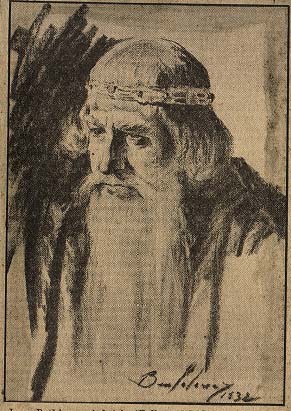 When the company moved into their present quarters at Lincoln Center, the Met asked for the portrait to be officially donated. Much to their dismay, the family asked for the portrait to be returned. When Rothiers widow passed away some years later, she instructed her husbands remaining effects to be given to the Met and the portrait made its way back. But before it could be re-hung, Rothiers daughter came in and asked for some small token of remembrance of her father, and while the archivist was away, she left with the Solowey portrait. At last the Met bought the drawing and it now resides in their permanent collection. 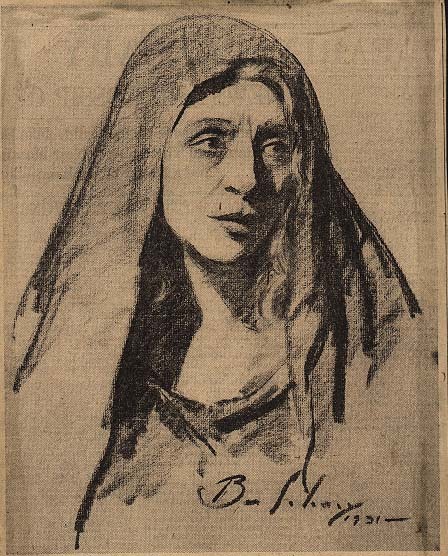 Perhaps the two most important theatrical productions captured by Ben in 1932 were the satiric musical Of Thee I Sing, the first musical to win the Pulitzer Prize for Drama, and Eugene ONeills powerful epic, Mourning Becomes Electra. Ben drew the two senators from the Gershwin  George Kaufman  Morrie Ryskind musical, George Mack and Edward Robbins. For the ONeill drama, Ben first captured the two female leads, Alice Brady and Alla Nazimova in a legendary double portrait before the show opened in October 1931. Ben had arranged separate sittings with each actress, but when the playwright came to the rehearsal, Ben could only get 15 minutes with each actress before they went on stage. Nevertheless, he created a stunning portrait that appeared the day before the show opened. The five hour drama played 150 performances before it was forced to change theaters, and consequently casts. In the new cast, Ben drew actor and playwright Crane Wilbur in his last Broadway appearance before leaving for Hollywood to be a screenwriter for B movies. 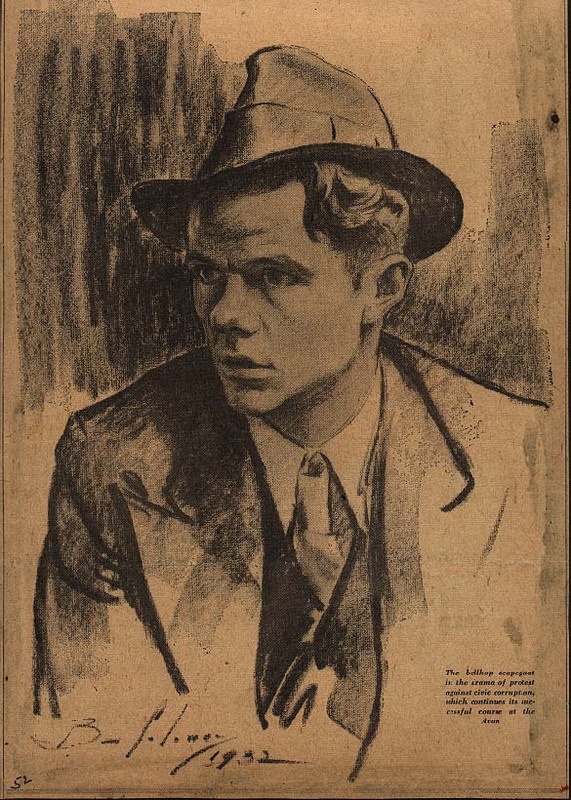 While no film drawings there were portraits of performers who would have careers as character actors in Hollywood: Elisha Cook Jr. and Thomas Mitchell. The slightly built Cook was sometimes called the screens lightest heavy. He is best know today as Wilmer, the psychotic hood in The Maltese Falcon (1941) to whom Humphrey Bogart puts down by saying the "The cheaper the crook, the gaudier the patter." He was also memorable as a hapless would-be tough guy in The Big Sleep (1946), and a feisty, tough talking homesteader in Shane (1953). Thomas Mitchells credits as a character actor read like an honor roll of 20th century American film. Lost Horizon, The Hunchback Of Notre Dame, Mr. Smith Goes To Washington, Gone With The Wind, It's A Wonderful Life, and High Noon. He won a Best Supporting Actor Oscar in 1940 for his role as the drunken Doc Boone in John Ford's Stagecoach. 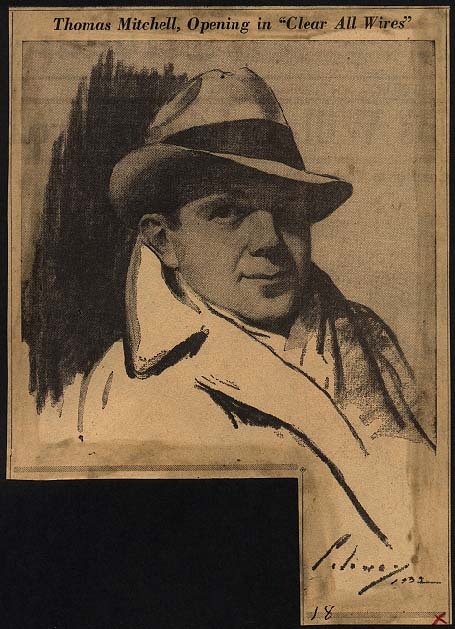 Of the 53 Solowey portraits that were published in 1932 we know the whereabouts of 31 of them. Two are in the Solowey collection, 27 in the Spielvogel Collection. 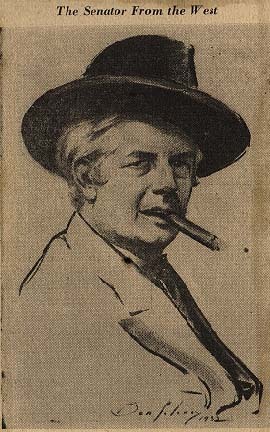 William Danforth, a member of the famed DOyly Carte company of Gilbert and Sullivan players is in a private collection, and the Rothier drawing, as noted above is the Metropolitan Operas collection. Almost all of the works mentioned above can be seen online. 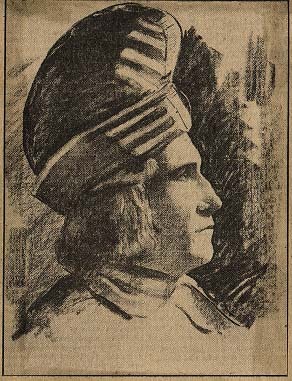 As part of our Digital Initiative, we are continuing to add more Solowey Theater Portraits on the web. Check on a regular basis for updates to our Theater Portrait list.